One of the biggest mistakes I see in self-published print books (like those created on CreateSpace) is in the choice of typefaces. They’re either too common or too weird. If you want to see the array of typefaces available in the market today, check out MyFonts. It’s a nicely designed site where you can easily purchase fonts you don’t already have on your computer. Oh, and one more thing: if you’re working on an ebook, it doesn’t matter which font you choose because the reader has control of the fonts and font sizes in your book. So pick something vanilla and use it throughout: Times New Roman is fine–12 point for body copy and 14 point for chapter openers. Filed under: best typefaces for books - book design - choosing book fonts - fonts. Thanks for the interesting and informative article. I’m about to self publish my fiction novel on KDP and judging from the word count of around 120,000, I’m probably going to need a 6″ x 9″ trim size at 300 words per page. At least, that’s what I’ve calculated from books of a similar size. What I can’t establish is the font, since many recommend Palatino Linotype and the physical book I’m using as an example appears to be using ITC Berkeley. Which font would you recommend for a book of this size? Palatino is nice. You might also take a look at Baskerville because it’s also compact. But the most important consideration is this: when you look at a full page of text, does it feel easily readable to you? If it’s too compact, you’ll get that feeling of ugh, hard to get through this page. If you choose a font other than one of these, your readers’ Kindles will render your words in whichever of these fonts the reader chooses, which means you have no idea what it will look like on their ereaders. Thank you so very much Holly! I appreciate this topic! I like 1.15 line spacing, too. However, I prefer wider margins for 6×9″ books. In my humble opinion, one of the “tells” of self-published books is too-narrow margins. While .5″ is okay, I’d suggest trying .75″ and even 1.0″ margins. I based my margins off of those used by industry (vice self-publish) as confirmed by online research and use of a ruler in the bookstore of books in the 6×9 format. Industry economizes white space to save on paper and improve profit. So, while you find it telling, I find it aligning to industry norms. 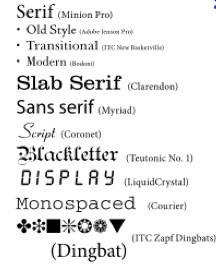 Hello & thanks for the great tips on fonts for self-publishing. Do you have any recommendations about where I can find information about line spacing, margins & other tips regarding the exact layout for self-publishing? Good question. I answered it in today’s post. Check it out. we are an NGO and we are starting designing some text books (class books, homework books work books etc.) for Kindergarten and grate 1 to 5 books. Is there any specific fonts we can use for kids or is there any research on it. What font do you suggest for these book. There are some fonts designed especially with children in mind. Most are relatively simple, with open letter shapes. Sometimes just looking at the letter “a” can give you a clue. A simple round shape–not the kind with a bulbous belly and a quail-like topknot (okay, am I being too creative here? )–is probably better because it mimics what children who are learning to write are taught. Take a look at Gill Sans Infant or Sassoon Primary. If you must use one of the fonts that comes with the Mac, check out Futura or Monaco. They’re not particularly elegant, but they’re easier for kids to read. What fonts would you recommend for a children’s book? I’d leave that decision up to your designer. It depends on so much–are we talking about a book that young kids read themselves, or one that adults read to children? What ages are we talking about? Is the book a lighthearted fiction picture book or a science book on animal critters? The younger the child, the simpler I’d make the font, but that still leaves a huge number of fonts to consider. If you have an iPad, check out the app Font Scout for some ideas. What font(s) would you recommend for a handwritten letter or an invitation within a novel? I wouldn’t recommend anything that looks like cursive writing, if that’s what you’re thinking…unless your book is for kids. I’d simply work with your designer. Maybe choose a sans serif font if your main narrative text is serif, or vice versa. You just want it to be set off slightly so that your reader understands that it’s different. Why would you give advice on self publishing then advice people not to? There are many successful self publishing authors. It seems very misleading to me. I am a writer and I am in the process of editing my book for self publishing. I graduated from an accredited on line school for Creative writing. I studied extensively for two years self publishing and editing. I also have great marketing skills. I have had my novel professionally critiqued twice. I see no reason why I should not self publish. Traditional publishers can not give you any successful guarantee either. I’m not sure why you think I’ve advised writers not to self publish. I am foursquare for writers thinking through their options–and for many, perhaps most, self publishing is the way to go. But I am always hoping to point out the pros and cons of both traditional and self publishing. “Ah! Upon re-reading the post, I see why Joy may have been confused. I did not mean that Century Gothic could not be used, it is a perfectly nice geometric sans serif typeface. But its name might confuse someone who is not familiar with the typeface Century, which is a serif typeface, hence its inclusion in my list of serif typefaces. Great choices – Minion Pro, Georgia, Garamond for serif, and Myriad & Helvetica Neue are my favorites. Glad to see I’m in such good company! Two more titles I would recommend – Bringhurst’s THE ELEMENTS OF TYPOGRAPHIC STYLE, and JUST MY TYPE – don’t recall the author as my copy is out on loan. The Bringhurst book is one I have used since it came out and I have all three editions of it. Very educational, but you need to be a bit of a type nerd. JUST MY TYPE would be a good read before getting into Bringhurst. I will track down your recommendation so I can share it when I give talks to NABP’s small publishers who make up the membership.